"e-Mail " is the top most communication factor which is used by each and every people in this world. May be you don't believe but this is true that due to some software bug , around 0.02% people of the world lost their all emails from Gmail and Google can not help them. The first option to backup your emails from Gmail is Microsoft outlook. But it's alternative option is Mozilla Thunderbird which is more effective than Microsoft outlook. Microsoft outlook is not good at IMAP. In place of it mozila Thunderbird is best at IMAP application. So here we know how to backup our all emails from Gmail. How to backup each and every email from Gmail account to your computer or hard drive? Step 1: Go to your Gmail account setting page. Now go to "Forwarding and POP / IMAP" tab. 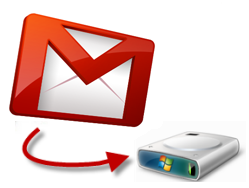 Select enable POP for all mails and after that select keep Gmail's copy in the inbox.Now follow below steps for back up setting. Step 2 : Download Mozilla Thunderbird to your computer and install it. Step 3 : Run the program and go to tools >> account setting.Now select account action. Here type your Gmail name, email address and your Gmail password. Make sure that you should type all these login credentials of your Gmail account. When you select create account button then Thunderbird will start downloading your emails. Step 4 : Now go to tools>>account settings again and select server setting. Here make sure that check for new messages every is between 10 to 60 minutes.also select leave messages on server. After complete this step go to disk space and junk setting. Step 5 : In disk space make sure select don't delete any messages as well as in junk setting select personal address book and press "OK" button. Thunderbird has now download all emails from your Gmail account to computer drive and also has downloaded new inbox and new draft messages. Make sure that to complete download of all incoming emails your internet connection must be on that means it must not be interrupted. Even chances are very rare but POP may download virus/spyware/marware from your Gmail account to computer hard drive. I am one of developer team member. Thanks for sharing such a nice information. Here I would like to share another simple tool for organize your inbox known as Beyond Inbox. Using Beyond Inbox you can not only Backup mails but also transfer emails from one account to another account and Restore the back up emails. It is also provide Incremental backup plan, which provide facilitates the users to download newly arrived mails after last back up. You can run this application on Windows, Linux as well as on Mac Os.